In the winter in the Northern Hemisphere, forecasters keep a close eye on something called the Arctic Oscillation Index—a measure of atmospheric pressure and wind patterns over the mid-to-high latitudes. In November 2018, the Arctic Oscillation Index was unusually negative. 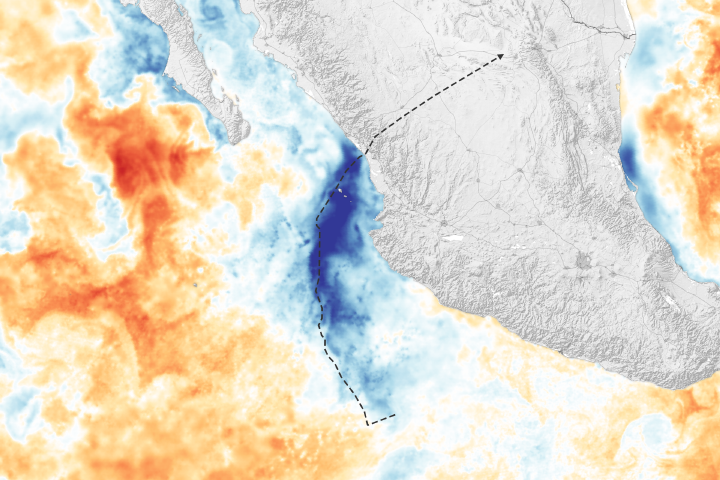 “This tends to push storm tracks farther south, which allows for the dominant flow over land to be from the north, which draws cold air from the poles,” explained Joseph Munchak, a meteorologist based at NASA’s Goddard Space Flight Center. 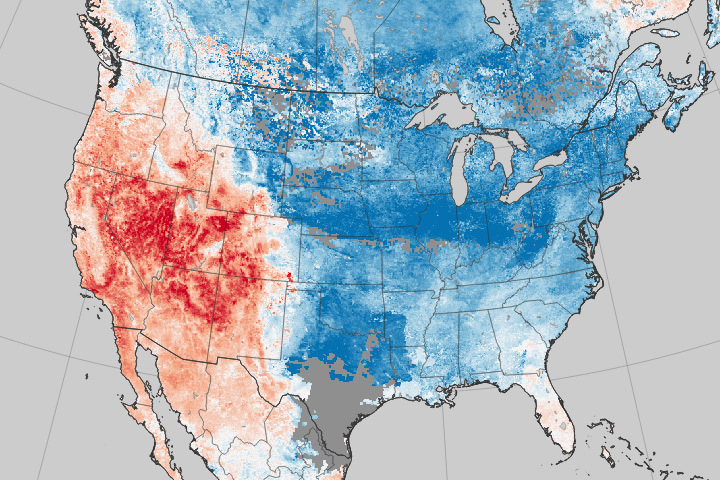 As blasts of cold air from the Arctic spread across the central and eastern United States in November 2018, storm systems brought unusually early and expansive snow cover to North America. However, one of the realities of the atmosphere and weather is that when a cold snap hits one area, another nearby area often bakes. In this case, while people in eastern Canada and the eastern United States scrambled to dig out winter clothes in early November, Alaskans basked in abnormally warm and snow-free weather. 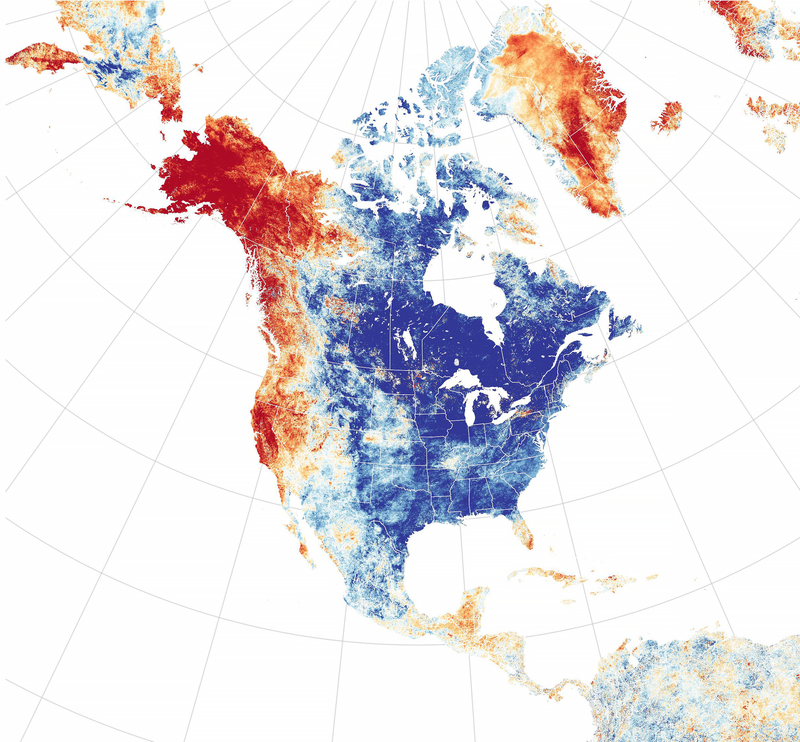 The map above shows land surface temperature anomalies in North America for November 1–30, 2018. 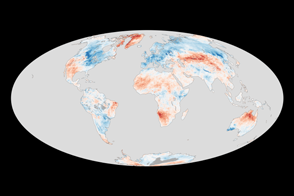 Based on data from the Moderate Resolution Imaging Spectroradiometer (MODIS) on NASA’s Terra satellite, the map depicts temperatures for November compared to the 2000–2012 average for the month. 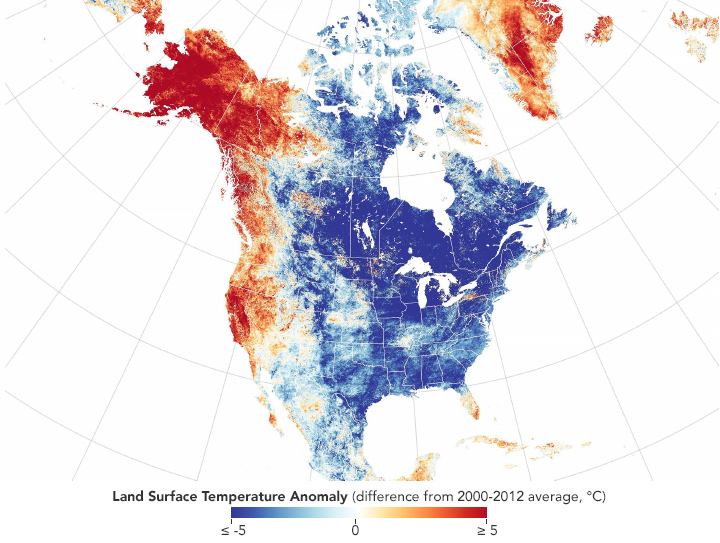 Areas with warmer than average temperatures are shown in red; near-normal temperatures are white; and areas that were cooler are blue. 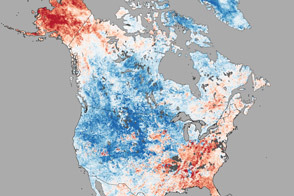 A long meander (or Rossby wave) in the jet stream was the common thread that connected the warm weather in Alaska and west of the Rockies with the chill to the east. 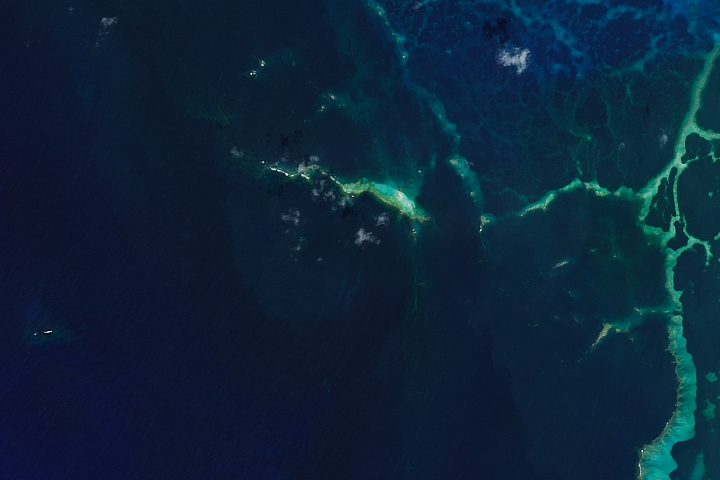 As the crest of a Rossby wave—a ridge—pushed unusually far toward Alaska, it brought warm tropical air with it. In response, the other side of the wave—a trough—slid into the eastern United States, dragging along pulses of dense, cold Arctic air. Neighboring ridges to the east kept Greenland and Scandinavia unusually warm, as well. MIT climatologist Judah Cohen pointed out one of the underlying mechanisms that sent the cold air flowing south. Twice in November, warm air masses flowed vertically from the troposphere to the stratosphere, displacing and elongating the polar vortex, the large area of low pressure and cold air high above the Arctic in the polar stratosphere. As this energy ricocheted off the stratosphere and “boomeranged” back into the troposphere, it positioned the pressure fields that distorted the jet stream and put the ridge over Alaska, according to Cohen. 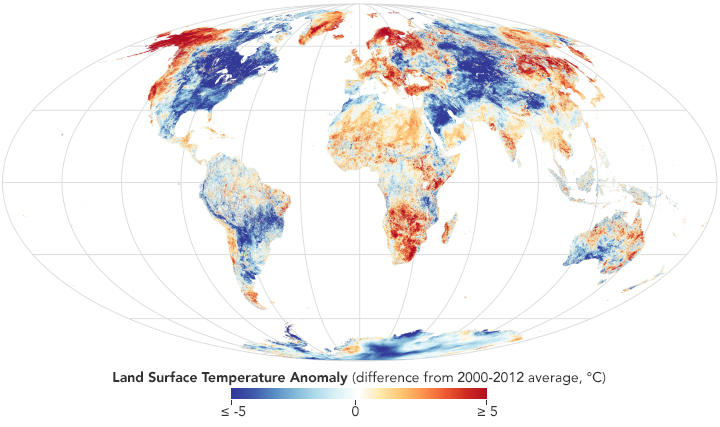 The second map shows a global perspective of November temperature anomalies. Even as the Eastern U.S. froze, comparatively toasty conditions dominated many other parts of the world including Western Europe and Eastern China. Around the time the cold snap was peaking in the eastern United States, several meteorologists and climatologists cautioned against drawing conclusions about the weather based on a few weeks. 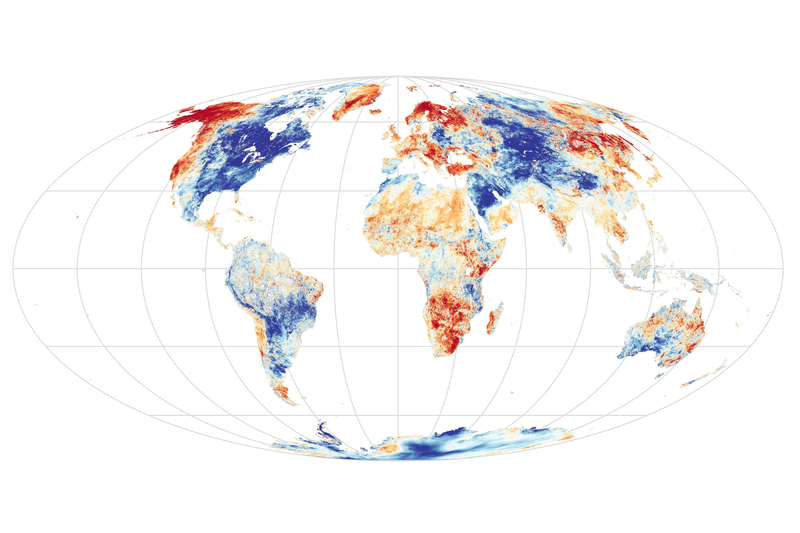 NASA Earth Observatory maps by Lauren Dauphin, using data from the Level 1 and Atmospheres Active Distribution System (LAADS) and Land Atmosphere Near real-time Capability for EOS (LANCE). Story by Adam Voiland, with assistance from Gary Partyka. It was cold across the eastern part of North America, but the opposite was true in other parts of the world. ABC (2018) Major pattern change: milder, drier and sunnier. Accessed December 5, 2018. Atmospheric and Environmental Research (2018) Arctic Oscillation and Polar Vortex Analysis and Forecasts. Accessed December 5, 2018. European Commission (2018) Surface air temperature for November 2018. Accessed December 5, 2018. National Snow & Ice Data Center Arctic Oscillation. Accessed December 5, 2018. National Weather Service Daily Arctic Oscillation Index. Accessed December 5, 2018. The Weather Channel (2018, November 27) A November to Remember: 7 Ways It Has Been an Unusual Month. Accessed December 5, 2018.